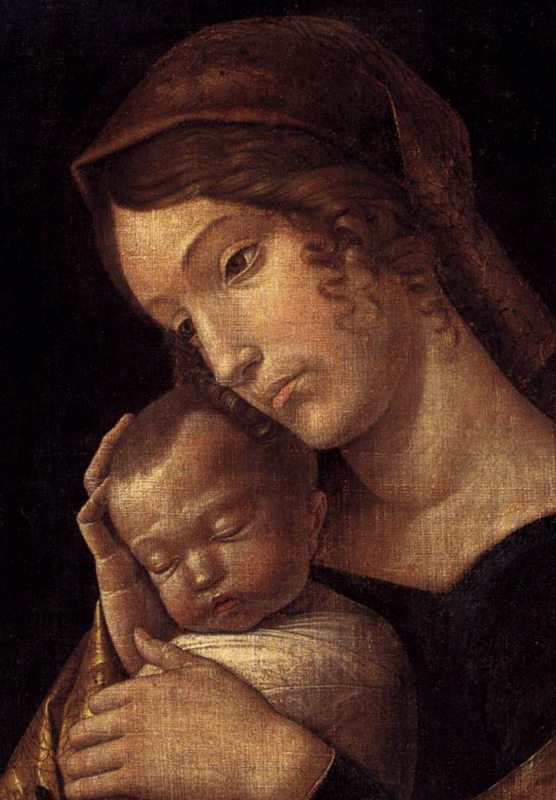 This image of the Madonna and Child from the mid-fifteenth century is unusual in that neither figure has a halo. Keith Christiansen remarks that by this the human dimension of the theme is emphasized over any interpretation of a religious text.1 In fact, the opposite is true. 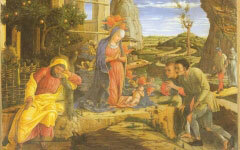 In emphasizing their humanity Mantegna turns our attention from a literal interpretation of the Bible, the Madonna and Jesus as semi-divine beings, to their role as an archetype for us all. Note how the near eye of the Madonna is not angled inwards in line with her face but is drawn as though the eye was directly facing us. It is a common sign in self-portraits, from at least Goya to Lucian Freud, that we are not looking at a self-portrait set in real life but in their mind, with the eye as the point of entry.2 In addition, the Virgin's simple headwear is similar to that worn in portraits of Renaissance artists by Agnolo Gaddi (c.1380) and Uccello (c.1470).3 Michelangelo, we have seen, identified with the Virgin in his Vatican Pieta; why not Mantegna? 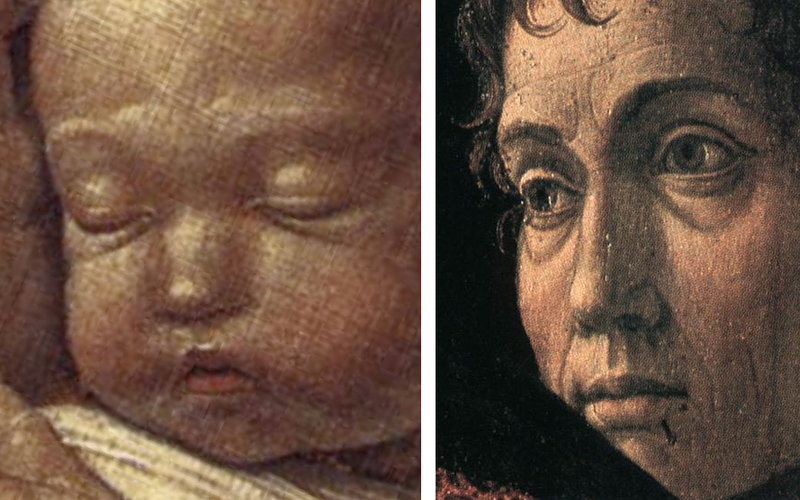 Mantegna even fused some of his own features into the infant Christ's face, his high arching eyebrows and the fold of skin below the eyes. 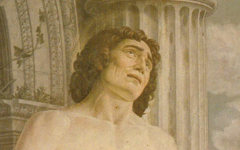 These lines are prominent features of all Mantegna's adult self-portraits as large loops beneath his eyes. 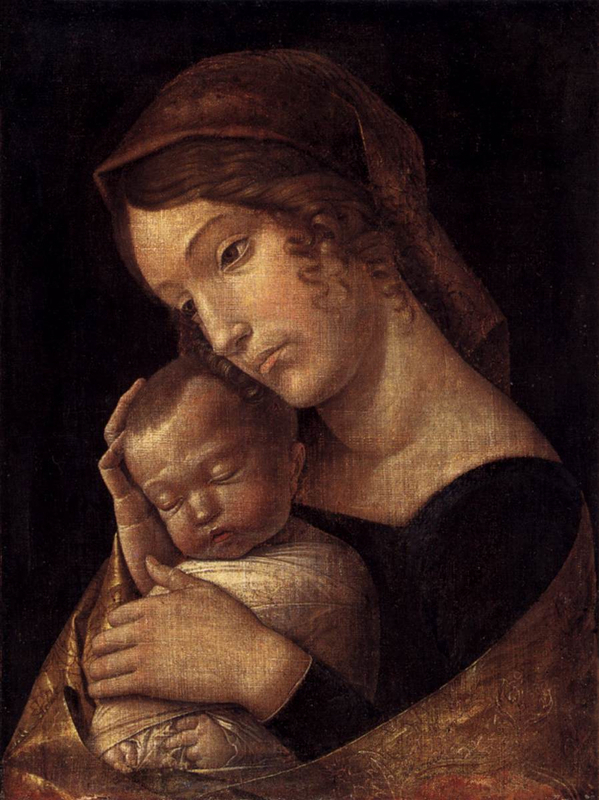 Whether or not the latter assertion is valid, I have little doubt about what we are not looking at: the Virgin and Child as two human beings, as Christiansen would have us believe. Mantegna identifies with both figures as internal aspects of his own mind and soul, suggesting for those capable of seeing that we can too. We were all born in the likeness of God and it is art's mission to guide our souls so that each of us can once again see the likeness of God inside us. 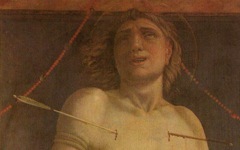 In this 1490 version of Saint Sebastian in the Ca' d'Oro, Venice, Saint Sebastian has one leg in the "picture", so to speak, framed by the marble, with the other stepping forward out of it into our space. 3. See Agnolo Gaddi's Self-portrait with His Brothers, Gaddo and Taddeo in the Uffizi Gallery, Florence and Paolo Uccello's Five Founders of Renaissance Art in the Louvre, Paris. Original Publication Date on EPPH: 11 Jun 2011. © Simon Abrahams. Articles on this site are the copyright of Simon Abrahams. To use copyrighted material in print or other media for purposes beyond 'fair use', you must obtain permission from the copyright owner. Websites may link to this page without permission (please do) but may not reproduce the material on their own site without crediting Simon Abrahams and EPPH.